More than 400,000 people have left their homes after an earthquake rocked southwestern China, killing one person and destroying thousands of houses, state media said Friday. Thursday's magnitude-6.0 temblor, centered in Yunnan province's Yao'an county, also injured 325 others, 24 seriously, the Xinhua News Agency said. 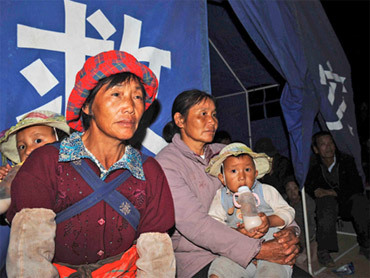 Yunnan Television showed displaced residents sleeping outdoors in makeshift beds made up of brightly colored quilts. Others packed into emergency tents, bundles of provisions and clothing in tow. Often people leave even undamaged houses after earthquakes because they are afraid to sleep indoors while aftershocks continue to shake the area. Piles of rubble from damaged houses made of brick and clay were scattered on the ground in the footage. At a hospital, nurses gave intravenous drips to the elderly. Eight aftershocks have followed Thursday's quake, with the latest registering a 5.2-magnitude Friday evening, Xinhua said. There were no immediate reports of casualties. An official at Yao'an's disaster relief command center said late Friday that rescuers at the scene were still assessing the damage, but he did not expect the death toll to rise. More collapsed homes, however, may be discovered in the mountainous, sparsely populated area, he said. He hung up without giving his name or any more details. So far, Xinhua said that about 18,000 homes have been destroyed and another 75,000 were damaged, Xinhua said. It said China's civil affairs ministry has ordered the immediate delivery of 5,000 tents and other relief materials. The provincial civil affairs department has already allocated 4,000 tents, 3,000 quilts and other relief materials to Yao'an. More than 1,000 police and soldiers have been dispatched to the disaster zone, Xinhua said. "By using simple tools and even their bare hands, the soldiers and militia have saved at least seven residents including two children," Xinhua said. China allocated 38 million yuan ($5.56 million) to the quake-hit area. In 1988, a 7.1-magnitude quake in Yunnan near Myanmar killed 930 people. More than 15,000 people died after a magnitude-7.7 earthquake in the province in 1970, though authorities at the time covered up information on casualties and damage amid the chaos of the Cultural Revolution.